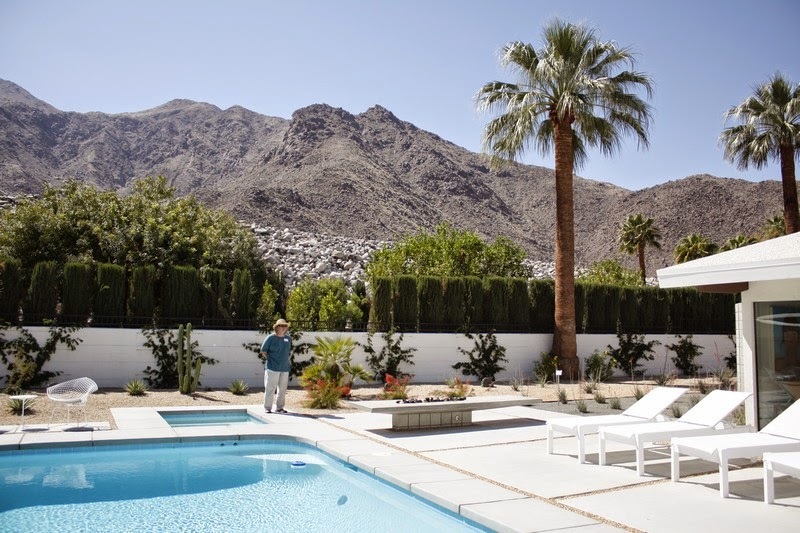 Yesterday was the Palm Springs Garden tour organised by the Desert Horticultural Society and five local gardens were open to visit. 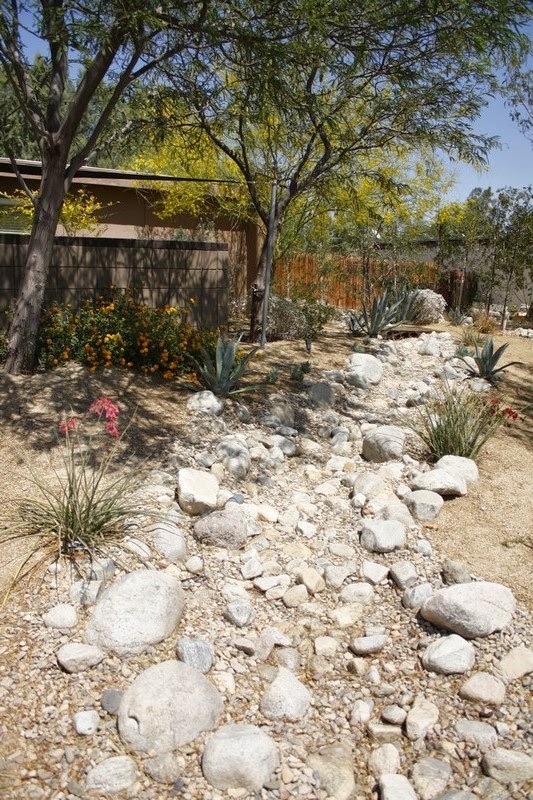 The society 'promotes the use of desert appropriate plants in an attractive, environmentally sustainable landscape'. 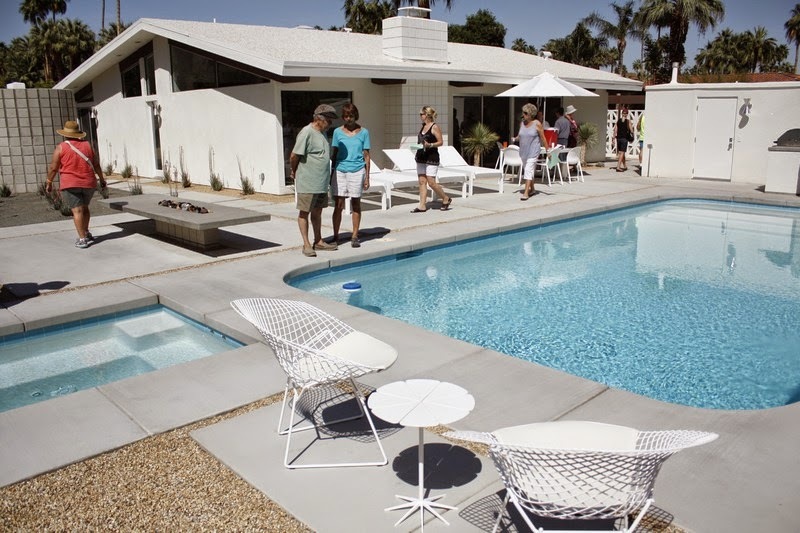 In past years, I have always had to return to the UK by this time, so never been on this particular tour, although I have previously done the Modernism garden tour. 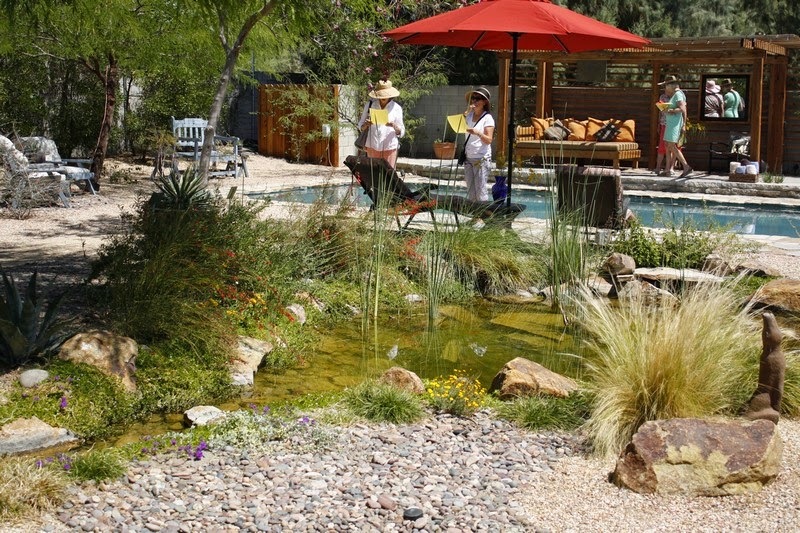 The gardens were all distinctly different and it was good to have the opportunity to chat with the owners and garden designers in some of them. Jim and I did the tour together as Philip was working. 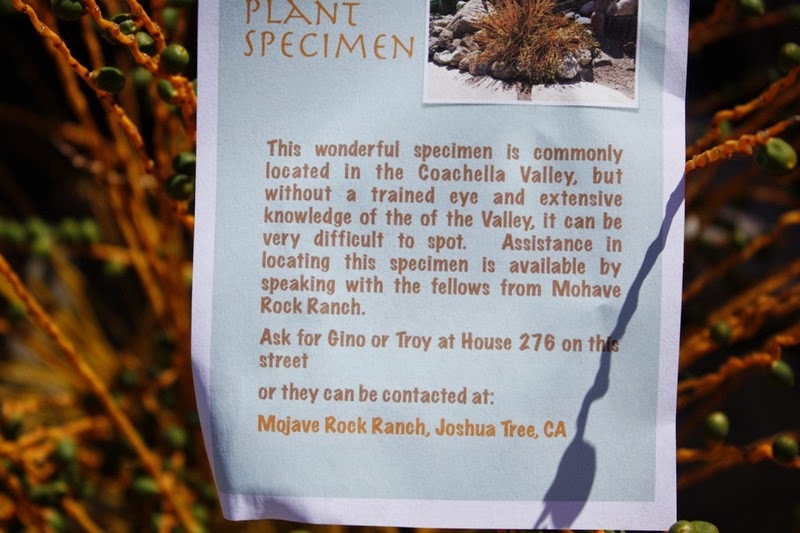 In one street we observed a curious 'plant' with a label explaining it was local to the Coachella Valley and for more information to ask the owners at number 276. Closer inspection revealed that the curious 'plant' was merely the head of a palm flower stuck in the soil - very common but rarely seen by those of us that don't climb to the dizzying tops of palm trees! I guess the owners of 276 may have been less than amused by the end of the afternoon! 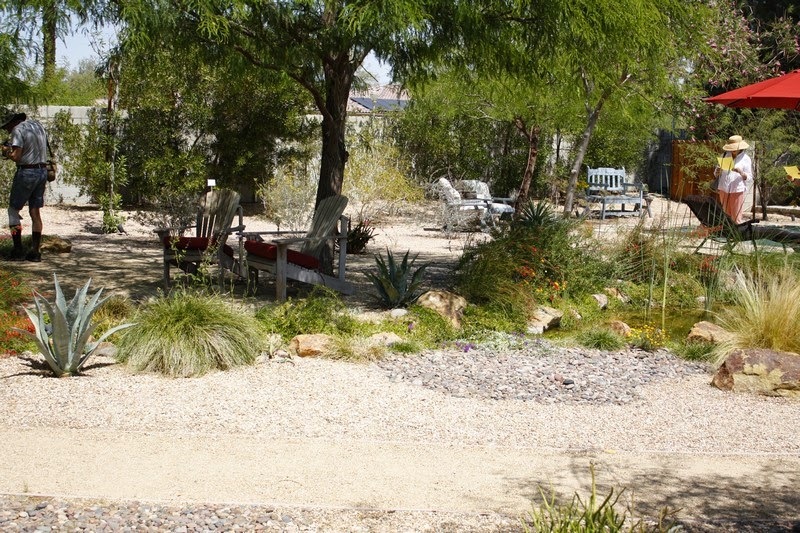 The first garden in East Joyce Drive was informal and created by its owner, a lovely gentle landscape with a centrepiece of a pool and cascade, possibly not the most desert-friendly feature during a drought but still a great garden. The second garden in North Burton Way is a beautifully designed garden which although only planted some six months ago had a certain maturity. 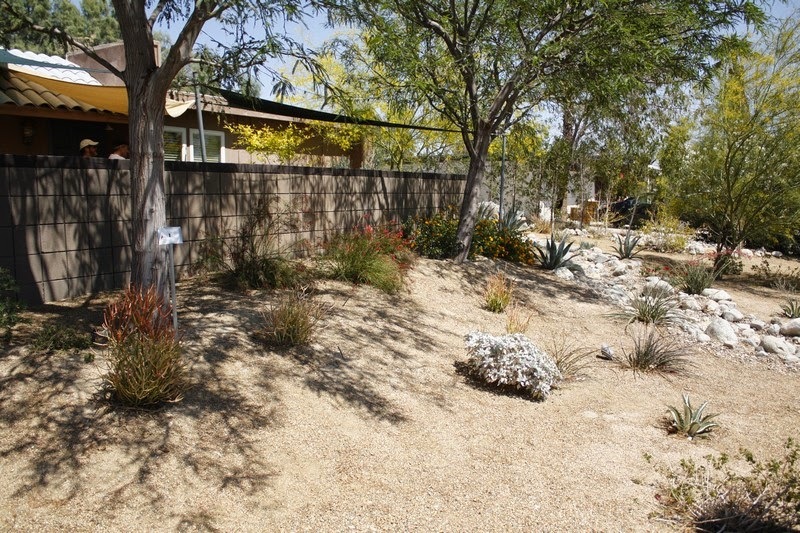 The landscape architect had retained some existing plants and repositioned others. 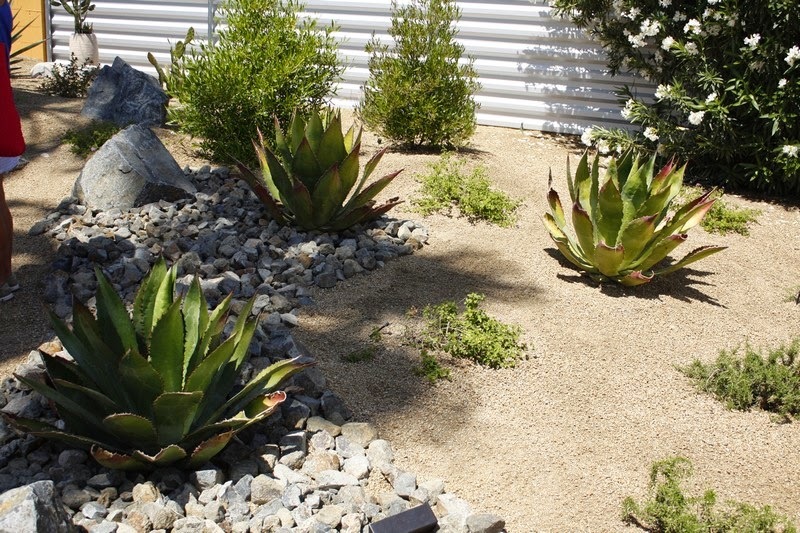 I particularly like the way he had set groups of Agave in contrasting stone and gravel. 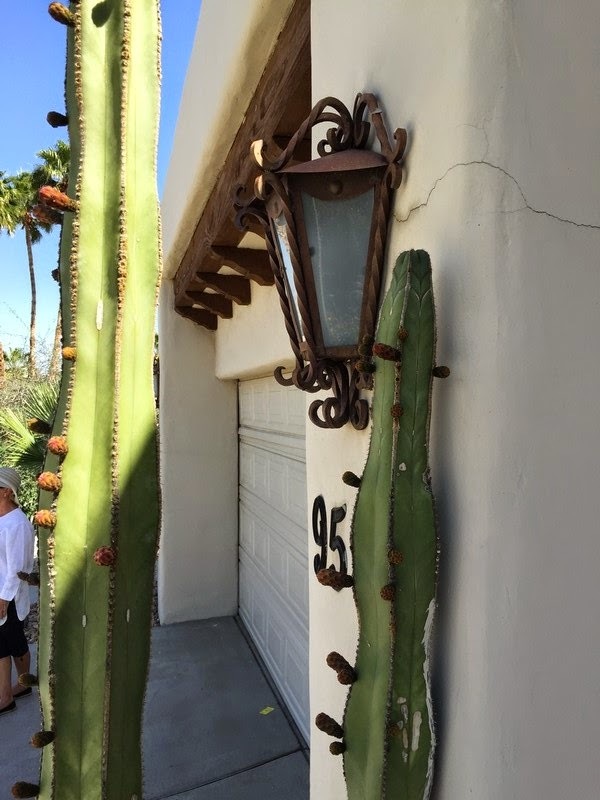 Anyone know this cactus? 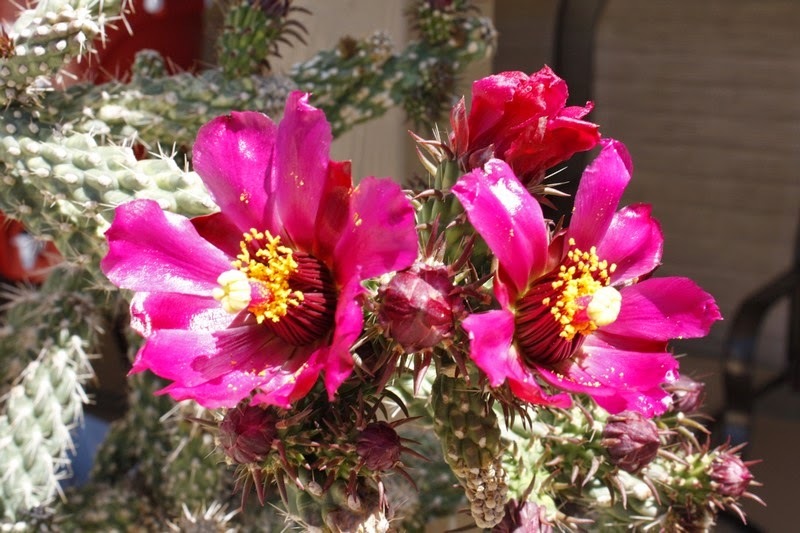 - Cylindropuntia spinosior - thanks again Chad! Name anyone? - u[date - Echinocereus triglochidiatus - thanks David. The garden in North Rose Avenue was not my favourite. Much of it was white concrete with white furniture and it glared in the mid afternoon sun. I can't imagine what it will be like in the heat of August! 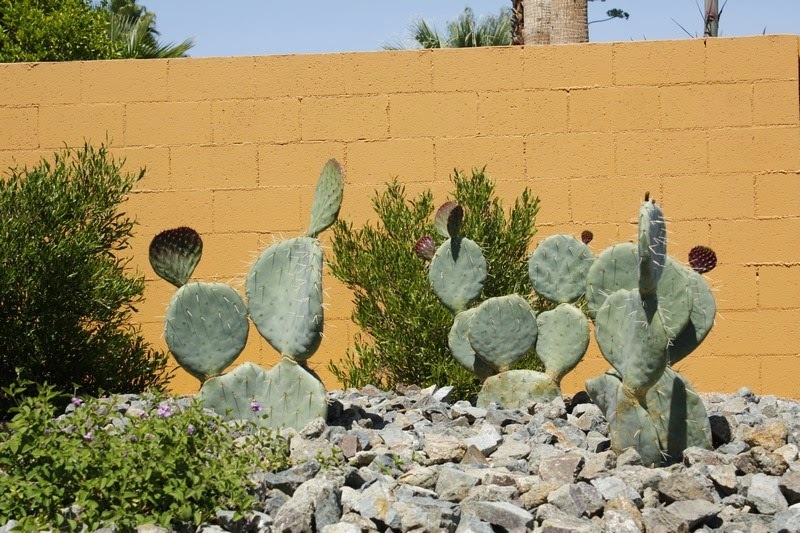 At the rear of the garden there is a large area tediously planted with evenly spaced aloes and dominated by a block structure which is actually an outdoor shower but less pleasant descriptions come to mind! 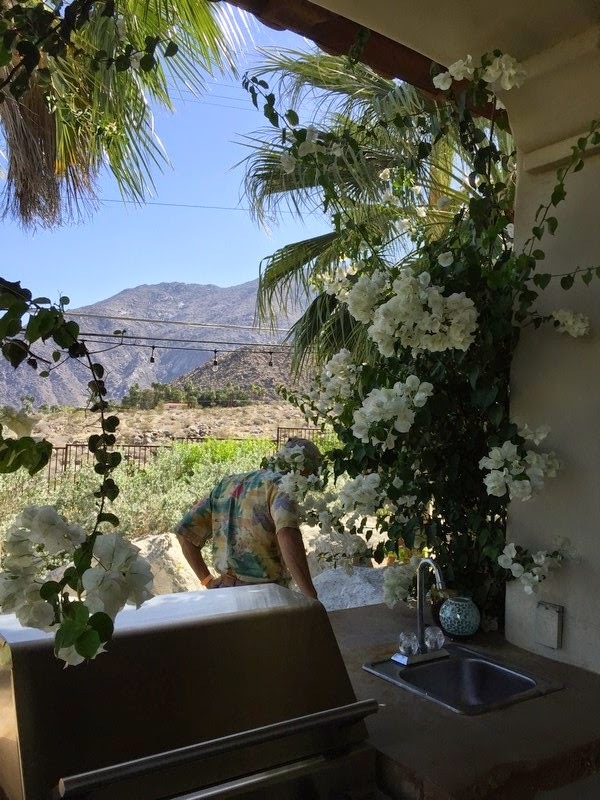 I love the idea of an outdoor shower but if I had one I would want to be able to stand and see the mountains not a cylinder of concrete. 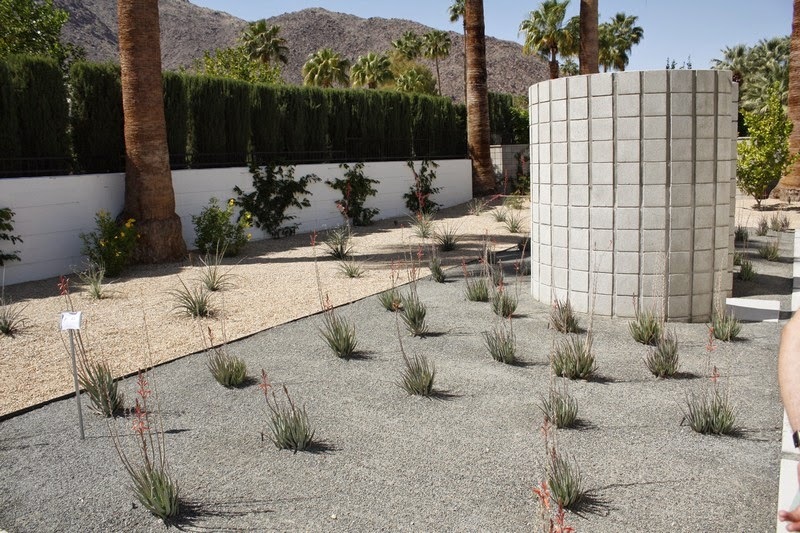 The best bit is a little enclosed area planted with a mix of desert plants surrounded by traditional pierced concrete blocks. The final garden visited is at the base of the mountains and created on a very rocky sloping site. For some reason, I took very few pictures. 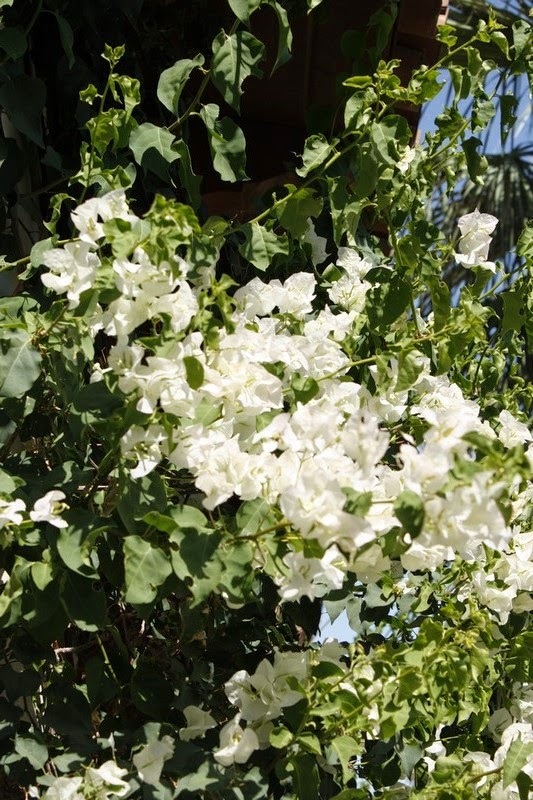 I loved the white bougainvillea which had been left to grow naturally and flower properly. We visited one other garden - my favourite and the most interesting of all, which I will write about next time! Thanks for posting these - very much outside my experience in both 'style' and plants! 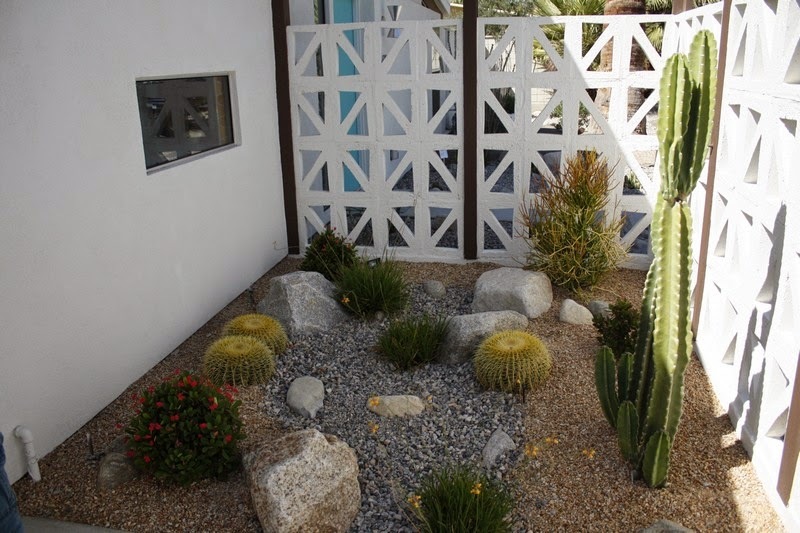 I will hazard a guess at the Cacti, but would be delighted if someone who knew more than me [almost anyone in this family!] has other ideas. I think 'Anyone know this cactus?' 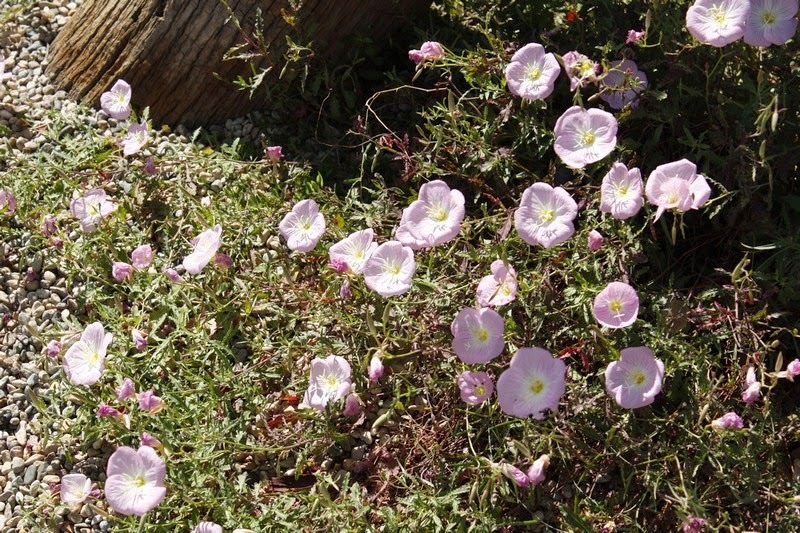 is a Cylindropuntia [they used to be 'cylindrical Opuntia' but now have their own genus] possibly C. imbricata. 'Name anyone?' 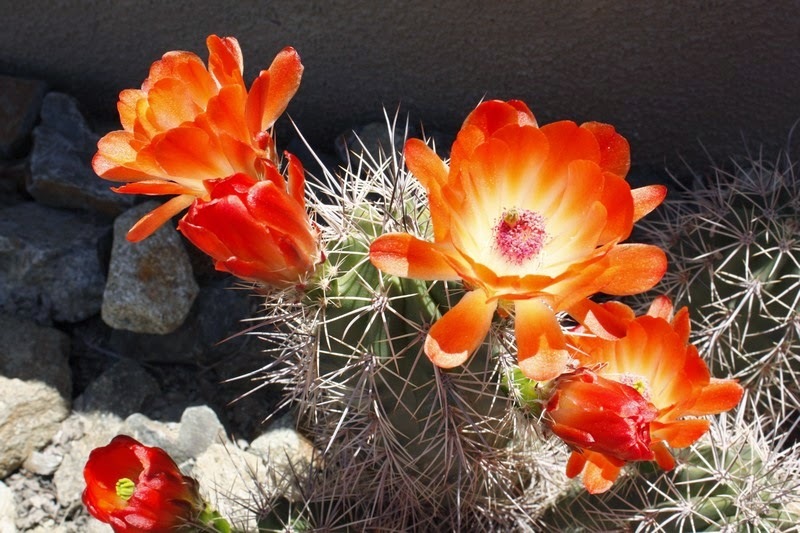 I hazard a guess at Echinocereus coccineus but I could be very very wrong! The Parkinsonia is interesting. 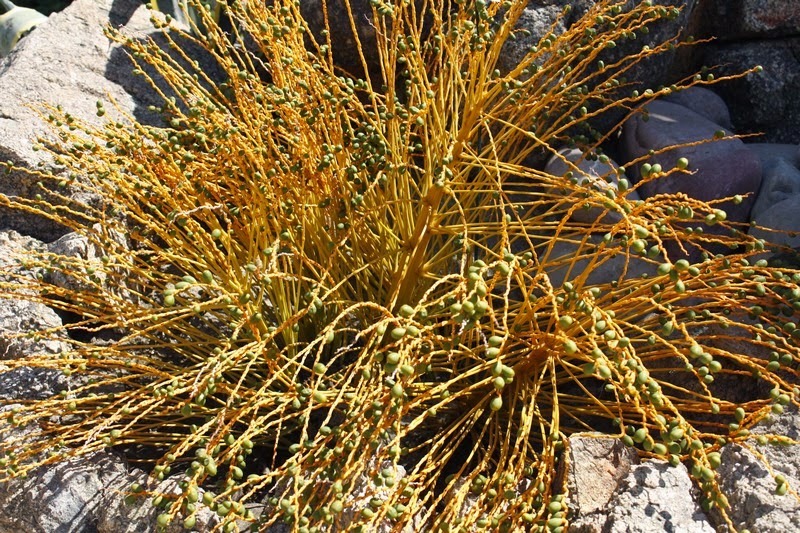 Note the length of the leaf axis, and the well developed compound pinnate leaflets. 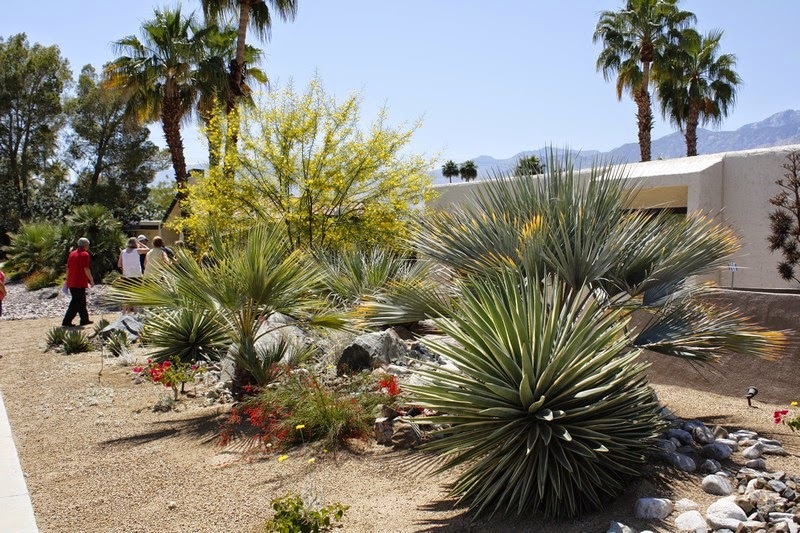 That is an odd combination and I think brings us to the hybrid P.'Desert Museum'. 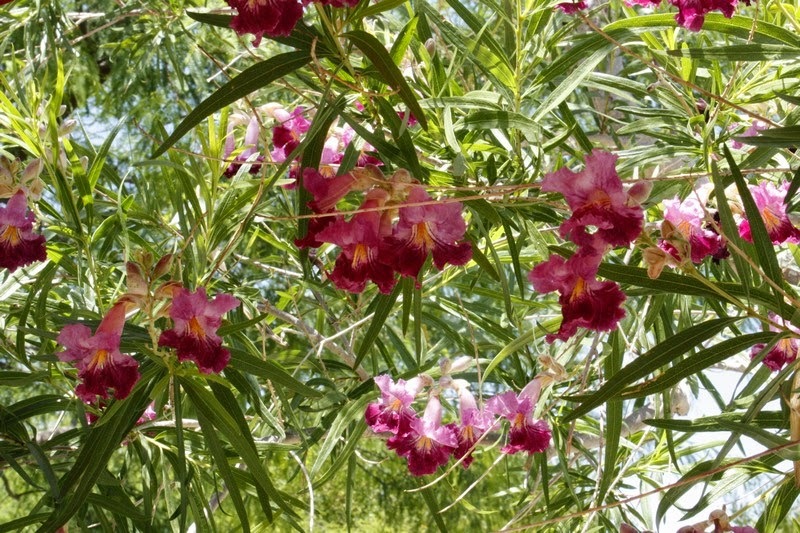 P.florida itself has short leaves [usually 3 pairs of leaflets] and a nasty spine behind each one. 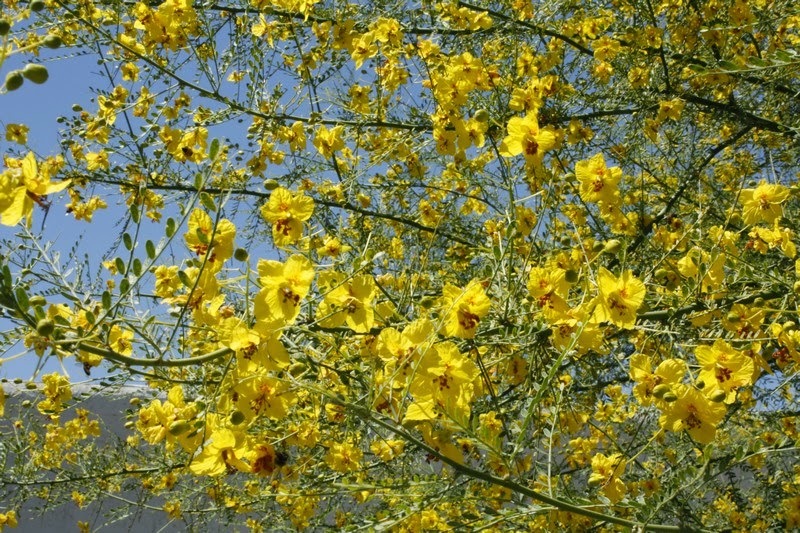 P.'Desert Museum' was wild collected and is thought to be a natural hybrid of [they've been busy with these names too] Parkinsonia aculeatae, Cercidium floridum, and Cercidium microphylum. Being spineless it is considered a horticultural advance! Chad - sincere apologies - your comment did come through but somehow I missed it. I have updated now. Corrections and identifications always appreciated! Sorry guys - getting confused - I had missed Chad's comment and David's first one didn't get through! Anyway - I have updated!